Hi everyone, I haven't posted in my blog for a while and just wanted to give everyone a quick update to keep everyone up to speed. Late 2016 and now 2017 will be a year of changes regarding my practice. As many of you may already know, I've started my new chiropractic office in Olathe, Kansas. I am currently still practicing in the Chinese Medicine Clinic in Kansas City, Missouri. For those who do not know, I have practiced out of that office as an independent contractor for several years now. Those close to me know that I have several reasons for wanting to branch out on my own. Well, late 2016 was the year that finally happened. The Olathe office isn't perfect, but I am doing my best to make it a great place to improve your health and recondition your spine and body. There are a few quirks to the office, including a big "AlcoholHelpCenter" sign out front (long story), but we're making it work so far. For the most part the office is a "one man show", with me doing everything from scheduling and insurance billing, to the treatment itself. While there are positives and negatives to this, I always try to settle back in my main goal of providing a personalized and effective way of improving your health. Stay tuned for more updates, follow me on Facebook and Twitter, and even subscribe to my new Youtube Channel for new videos on office updates, exercises, and treatment videos! Partial relief in 21% and complete relief in 74% of cases! For those of you who are unfamiliar, trigeminal neuralgia is a painful condition affecting the trigeminal nerve. This nerve supplies much of the sensation to the face. The pain can be extreme, giving the condition a reputation of being the most painful condition known to humankind. While there are multiple treatment options available, relief can be hard to find. However, upper cervical chiropractic has shown in a clinical setting to potentially to provide relief. While reviewing Kirk Eriksen’s, Upper Cervical Subluxation Complex: A Review of The Chiropractic and Medical Literature, much success is documented in relieving the pain. ​While it was an informal survey, it is certainly hard to ignore. Partial relief in 21% and complete relief in 74% of cases! If you have this condition, schedule a visit with us to see if Atlas Orthogonal Technique is a good option for you. While everybody responds differently to adjustments, many people prefer not to have their neck “popped”. While officially called Diversifed or Gonstead techniques, these techniques can be difficult to perform properly, especially if somebody has a more delicate neck. While some patients may stay away from chiropractors because of this fear, there are chiropractors who offer techniques without “popping” the cervical spine. At our office we offer techniques to gently re-align the vertebrae, without much discomfort. I believe most important for patients is to find a chiropractor that with which they feel comfortable expressing their concerns to, thereby relieving anxiety. While typical visits are much longer than traditional chiropractic treatments, we allow for greater communication, more gentle adjustments, and more thorough treatment. Especially considering we are one of a select few offices in Kansas City that is certified in atlas orthogonal treatment. Despite all of this we currently offer treatment that is at the same price as most traditional chiropractors in the area! This may soon change however as it is due to our office structuring. We also take most insurances. Expect to be seen two to three times per week to start, tapering off after two to four weeks in most cases. Feel free to call us with any questions and we look forward to getting starting on improving your condition. Doctors of chiropractic focus on restoring alignment of the skeletal frame and removing nerve irritation through that process. Upper cervical corresponds to upper neck. Therefore upper cervical chiropractic is the focus of restoring alignment to the upper neck vertebrae, and removing nerve irritation at this important area. There are several upper cervical chiropractic techniques in use today, atlas orthogonal technique being one of them. Upper cervical chiropractors acquire additional training in examining and adjusting the special anatomy of this delicate area. The upper cervical spine protects the uppermost portion of the spinal cord, and the lowermost portion of the brainstem. Due to the physiologic importance of this area, removing nerve irritation to this area can sometimes provide seemingly miraculous results. If you suspect you could benefit from upper cervical chiropractic, please schedule a visit at our office. ​Get a yearly physical, every six months get your teeth cleaned, but how often should you get adjusted? While there isn’t quite yet a universal rule for how often maintenance adjustments (adjustments after your initial treatment plan) should occur, my guess is that day will someday come. As a matter of fact, the founders and researchers of Atlas Orthogonal Technique (AOT) have recently established recommendations. Last year at one of their advanced seminars, they recommended that AOT practitioners check and adjust (if needed) their maintenance patients on a quarterly basis (every three months). AOT, however, specifically assesses and adjusts the vertebrae of the cervico-cranial junction, or upper neck. With AOT, most people can hold their neck adjustments for relatively long periods of time. However, AOT is a specialty and a general chiropractor may offer other recommendations. Most often, chiropractors will utilize multiple techniques that assess and treat the entire spine and extremities. Monthly assessment and adjustments are commonly recommended, however this is based on how the person’s body is likely to respond. People who have physically demanding jobs or complicating conditions may require more frequent adjustment, while some people may do well going for multiple months between visits. It is interesting to note, athletes training for sporting events may often receive benefit from adjustments weekly or in some cases, even multiple times per day. Once a person becomes accustomed to getting adjusted, they tend to recognize right away when they feel “out of adjustment”. This makes it an easy decision of when to schedule. However until this occurs, talk with your chiropractor and determine a schedule that makes sense for you and your health. Palmer College of Chiropractic (PCC) is the first chiropractic college to be established. The first adjusting technique taught at PCC is called Toggle Recoil. It is a technique that specifically adjusts the top part of the neck, the atlas and axis bones. The technique was developed in the early 1900’s by Dr. B.J. Palmer, the son of the founder of chiropractic. He spent most of his career teaching and practicing the technique. Since then there have been several other techniques developed which specifically adjust the upper cervical (neck) spine. After learning from B.J. 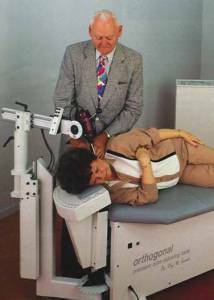 Palmer, Dr. John F. Grostic developed and began teaching his own upper cervical technique in 1946. It was called Grostic Procedure. One of the students and eventual teachers of the Grostic Procedure was Dr. Roy Sweat. After practicing and teaching the procedure, Dr. Sweat eventually developed a technique of his own called Atlas Orthogonal Technique. Atlas Orthogonal being a term that refers to the proper alignment of the atlas bone being at ninety-degree-angles to the skull and neck. He first began teaching the technique in 1980. Atlas Orthogonal was a radical departure from the earlier techniques because it made use of an instrument to perform the adjustment. Adjusting done by hand varied from each practitioner and took considerable physical ability. Dr. Sweat wanted to even the playing field, hoping that the instrument would allow for equal adjustments from each practitioner. Dr. Sweat has spent many years developing and refining the technique. Currently the R.W. Sweat Research Foundation is dedicated to research and continued development of the technique. -Written by chiropractor and board certified atlas orthogonist, Ryan Spurgeon. Dr. Spurgeon served as intern with Dr. Sweat after graduating from Palmer College of Chiropractic. Carpal Tunnel Syndrome Options: Chiropractic? Do you have sharp pain that extends from the wrist into all or part of the hand? Chances are, you may have carpal tunnel syndrome. This pain is caused by pressure put on a major nerve that travels through the wrist. The median nerve travels through the “carpal tunnel” of the wrist, hence the name carpal tunnel syndrome. Common treatment includes surgery, which can cost thousands of dollars, leave scarring, and can take months to recover from. Alternatively, chiropractic care often provides relief within a matter of days to weeks, is cost effective, and involves minimal to no risk. Desk workers and people who do a lot of repetitive movements of the hands are most susceptible to the condition. The repetitive motion can cause build up the musculature of the wrist and cause a build up of adhesions/scar tissue. This build-up of material, in combination with bone misalignment can narrow the carpal tunnel, putting pressure on the nerve. The bone most often suspect, is the lunate bone, a small wrist bone. Often a simple chiropractic adjustment at the lunate bone can relieve the pain at the wrist. However to have truly effective results we must assess and treat the entire upper extremity and neck and thoracic spine for misalignment. Putting the entire skeletal structure in alignment from the wrist to the neck prevents the lunate from going out of alignment so quickly. Soft tissue trigger point therapy and stretching will help for lasting and quick results. Every case is different, dependent upon the severity of the case, patient age, pre-existing conditions, etc., the treatment plan will differ. For most cases you should expect several weeks of treatment at two to three times per week. Pain relief often comes quickly, following through with a recommended treatment plan will help to prevent re occurrences of the condition. Recently at a seminar, we were learning about treatment and alignment of the upper cervical spine after whiplash injuries. The speaker was a very esteemed atlas orthogonal doctor and chiropractor. In passing he mentioned that when an atlas orthogonal doctor restores a proper alignment of the head and neck within 72 hours (post injury), the inflammatory response will be reduced or stopped. Meaning there won’t be as much pain, swelling, etc. Essentially if you more immediately reduce the misalignment, you will reduce the future swelling, pain, and suffering.